Baking is like a science; that's why it's important to use the right flour. Occasionally you can substitute, but flours all have different chemical reactions in a recipe, so it's always best to use the exact flour called for. Whether you're baking simple muffins or more elaborate cupcakes, be sure you choose the right flour. 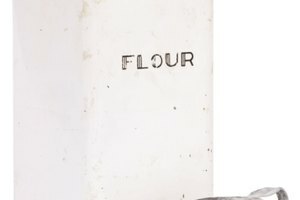 All-purpose flour is milled from a mixture of hard and soft wheat and is enriched with iron, thiamine, riboflavin and niacin. It may be bleached to whiten it and improve baking properties. 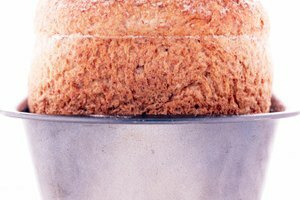 All-purpose has less gluten than bread flour, but more than cake flour. Different brands vary in gluten content, which is why some perform better in specific recipes. Many bakers stick with a familiar brand. Without the addition of leavening agents, baked goods made with all-purpose flour will not rise. Self-rising flour is white wheat flour that's also enriched with nutrients, but it has added baking powder and salt, which act as leavening agents. Self-rising flour produces a risen baked product without the addition of further leavening agents, like yeast. Properly substituting flours is usually a matter of adjusting the leavening agents, adding or subtracting as necessary. Do not substitute self-rising flour in recipes containing baker's yeast. To substitute self-rising flour for all-purpose flour, decrease the baking powder by 1 ½ teaspoons and decrease the salt by ½ teaspoon for every cup of flour called for in the recipe. When substituting all-purpose flour for self-rising flour, decrease the recipe's total flour by 2 teaspoons per cup, and replace that with 1 ½ teaspoons baking powder and ½ teaspoon salt per cup of flour called for in the recipe. 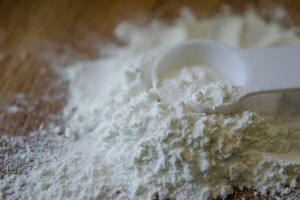 Baking soda is another leavening agent used in quick-bread recipes. Baking soda requires the addition of an acidic ingredient to cause the rising reaction. (Common acid ingredients are lemon juice, vinegar and cream of tartar. ) When using self-rising flour in these recipes, eliminate the baking soda and decrease or eliminate the acid ingredient.